For sometime I had thought of having a wood firing kiln but realized it would be a serious commitment and would lead to a new direction for my work, when are you ready for such an undertaking? 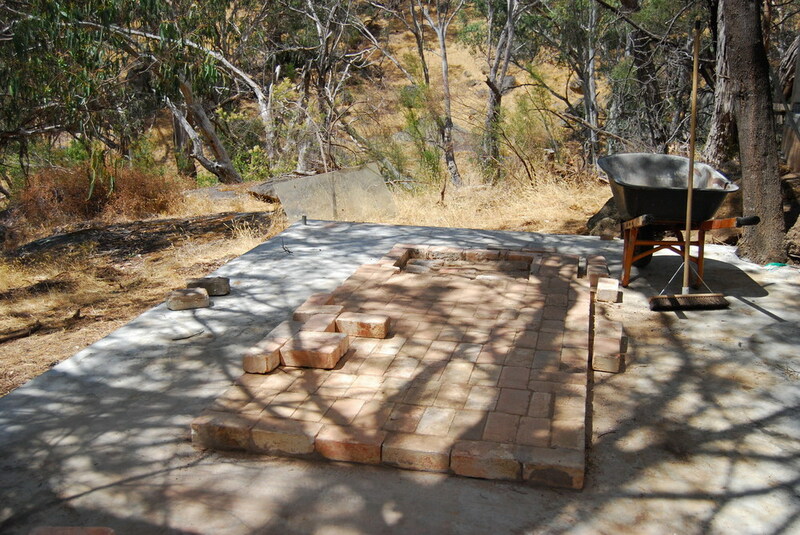 The annual firing at Graeme Wilkie’s anagamma over recent years had been my only experience woodfiring. Over the last decade my work has gradually moved in a direction that has made the move to wood firing the next logical step. This seems to coincide with my decade of working with traditional Indian potters. I believe the seed for building this kiln was sown in 2003 when visiting potters Giri Raj Prasad and Manohar Lal where overwhelmed by the amount of fallen timber in their eyes an unused recourse. It was certainly after my Asialink residency at the beginning of 2012 in Kumhaargraam India that my resolve to build such a kiln was confirmed. Saying the words was the easy part. I live on a large naturally treed property sharing it with my architect/builder partner Peter, friend Jenny and now just left home two young men. We are not connected to the power grid so the limited solar power generated has precluded a studio at home. I was now considering a totally unpowered studio. There are a range of wood firing kilns, and building one is a serious physical and financial undertaking, on what basis do you make a choice ? My priorities were; easily fired with a one or two others, fuel efficient using locally found timber and the availability of a good plan. I was not interested in long firing for encrusted objects but a means to fire simple tableware efficiently. I could not make a decision, the sloping site suggested a small anagama but I kept hearing of the ease of firing a bourry box, but the design looked complicated. I went to Subversive, a ceramic conference in Adelaide late 2012 with the aim to come home with a decision. I favoured all the wood related presentations. It seemed to me anyone with an anagamma style kiln was in the process of or intended to make modifications but the Bourry box was being used enthusiastically. A brief conversation with Merrilyn Stock swung my indecision to the bourry box, she had just built and fired one and could send me the plans.